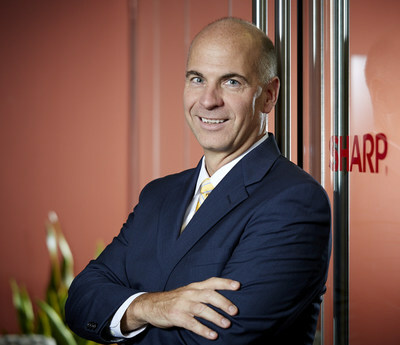 MONTVALE, N.J., May 10, 2018 /PRNewswire/ -- Sharp Electronics Corporation (SEC) today announces that Mike Marusic has been named President and CEO, Sharp Imaging and Information Company of America (SIICA), effective June 4, 2018, replacing Doug Albregts who has resigned from Sharp to pursue a new opportunity. In this position, Marusic will report directly to Ted Kawamura, Chairman of SEC, and will be responsible for directing the strategic growth and profitability of Sharp's Business to Business (B2B) operations. Doug Albregts will remain in the position until June 1, 2018 to ensure a smooth transition. Mike Marusic joined Sharp in 2002 as Associate Vice President of Marketing for SIICA. Over the past 16 years, Marusic has held a variety of executive roles, driving the marketing, business solutions, operations and technical services groups within SIICA. Most recently, he was named COO of SEC, responsible for directing all functions related to information technology, human resources, facilities, purchasing, operations and services, while also continuing to oversee the marketing strategies for B2B operations. His vast wealth of knowledge and expertise will be invaluable as he leads the SIICA organization to new levels of growth and profitability. "Mike has greatly contributed to SIICA's many accomplishments over the past several years," stated Ted Kawamura. "I am very confident that with his strong leadership and 'make things happen' management style he will drive SIICA to the next stage of growth and success." Marusic is a graduate of Siena College and earned his MBA from Fordham University. Prior to joining Sharp in 2002, he headed up the marketing group for Panasonic's copier and computer peripheral division and has over 25 years' experience in the office technology sector. "I'm very excited to take on this new position within the SIICA organization," said Marusic. "As Sharp continues to be recognized globally for its products and innovations, I look forward to working with all of our business units to enhance the brand in the market while developing sales and executing growth within the electronics industry." "I want to thank Doug for his service to Sharp over the past many years," added Sharp Electronics Corporation's Chairman Ted Kawamura. "Under Doug's leadership, along with Mike, they led Sharp in challenging financial times and significantly grew revenue and operating income for many consecutive periods. With their efforts, Sharp's business is poised for even greater success in the future. We wish Doug well in his new endeavors." Albregts joined Sharp in 2011 as President of SIICA and was appointed President and CEO of SEC in 2016. Prior to Sharp, he held executive leadership positions at NEC, Samsung and American Express and will be leaving Sharp for an opportunity outside the industry. "This was an exceptionally difficult decision for me to leave this great family and company. It has been a privilege to serve Sharp over the past six plus years, and I wish Mike and the team much success in the future," said Albregts. Sharp Electronics Corporation is the U.S. subsidiary of Japan's Sharp Corporation. Sharp is a worldwide developer of one-of-a-kind home appliances, networked multifunctional office solutions, professional displays and energy systems. Sharp Imaging and Information Company of America, a division of Sharp Electronics Corporation, markets Sharp's business products, including MX Series multifunction printer (MFP) systems, professional and commercial displays and Skywell™ atmospheric water generators.